BSA’s 2018 version of the iconic ballet has been choreographed by guest choreographers, Easton and Haley Smith, who moved to this area in 2016, following successful dance careers with a number of prominent ballet companies. Easton explained that the couple decided to settle in San Antonio – or more precisely in New Braunfels – after “auditioning” a number of other cities. “This is like home,” he said. Though he is now pursuing a new career as a realtor and Haley is a busy mom with two toddlers, they are still interested in ballet as teachers and choreographers. 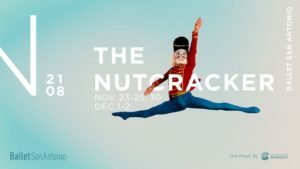 The pair introduced themselves to BSA’s executive director Evin Eubanks about a year ago and, this past summer, got that call about guest choreographing “The Nutcracker.” The new show opens Nov. 23 and runs through Dec. 2 at the Tobin Center for the Performing Arts. Among the new twists are stylistic elements inspired by the work of legendary choreographer George Balanchine; novel humorous moments in the battle scene between mice and toy soldiers, and slight changes in the story. In the Smiths’ interpretation, Clara is a 15-year-old who develops romantic feelings for her prince who happens to be Herr Drosselmeyer’s nephew. There are also tweaks in the opening party scene which lead to Clara’s dream starting earlier in the story than usually seen. And there will be other surprises in both acts. Expect the Land of Sweets divertissements that draw upon contemporary influences such as Le Cirque du Soleil and Georgian folk dance. (Well, the latter in not “contemporary” but it’s different from the usual Russian/Ukrainian folk style featured in the segment actually called Russian Trepak or Russian Dance.) No word on whether the dance has been renamed for this production. Clara, the girl at the center of the story, is portrayed by Brenna Mulligan, a talented teenager, whom Easton described as “phenomenal, close to professional level.” Other big roles are danced by the actual professional BSA members. Sally Turkel and Kate Maxted will portray the Sugar Plum Fairy on different nights, respectively partnered by Luis Javier Corrales Ceballos and Mayim Stiller. Stiller also appears as Herr Drosselmeyer, the black-clad, mysterious godfather who brings a nutcracker as a gift for Clara on Christmas Eve. Ryland Acree is the nephew/Prince. And, as always, there will be scores of dancing children bouncing about as party guests, toy soldiers, mice and pages. The San Antonio Symphony will play live for all performances.